As promised in this post where I have described setting up my newer NAS and its LVM filesystem, here is a previous set of posts from a few years ago focused on adapting a Thecus N5200 NAS by getting rid of the existing Thecus firmware and installing a vanilla Ubuntu OS and setting up a RAID 5 array. This is a set of how to guides that I wrote in 2010/11 when I was installing Ubuntu on a Thecus N5200 NAS. It is a great box (still using it today) with 5 HDD bays and I used it for a few years before I decided I wanted to get rid of the firmware and install Ubuntu. This is my first attempt at posting any guides like this so please bear with me. I’ll do my best to explain all my steps as I go along. Also I wrote this up in a plain text file so sorry that there is no formatting and no hyperlinks, I just tried to use consistent symbols etc. to highlight sections. I have added some colouring in these posts for convenience: blue = linux commands or text to be edited in config files, green = bits you need to customise not just copy and paste blindly. I first set up all this config in a VirtualBox with Ubuntu 10.04 LTS. I created 3x50Gb virtual drives just to mess about with the RAID config. This guide doesn’t cover any VirtualBox stuff. I started out with minimal Linux knowledge or experience. The only stuff I knew was what I had already done with the N5200, i.e. installing the SYS module to gain root access and playing with some basic commands. Doing this was a great way to learn a lot and using a VB test set up allowed me to experiment and make a lot of mistakes. From starting my testing to having a fully set up Ubuntu N5200 took about 2 months. Many thanks to all the helpful post in this forum and the Ubuntu forums. 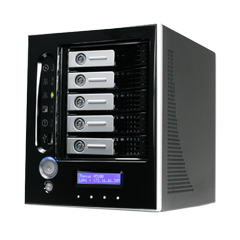 You can follow this guide and not have any data loss from your existing RAID however as always make sure you have backups. You should use this all the time when following this set up guide or else you’ll have to type sudo in front of all commands. Use SSH access to do all config as it allows copy and pasting from other machines, i.e. from this guide. Ubuntu is based on Debian so when looking for stuff to install on Ubuntu you’ll typically be installing the Debian packages. Just wanted to let you know in case you spent ages searching for an Ubuntu installation file! D-sub 15 Pin Connector for Motherboard/VGA Adapter Card, got mine off eBay (http://cgi.ebay.co.uk/ws/eBayISAPI.dll?ViewItem&item=310274177266) but I also saw a couple on a German website. They just clip in so no need to do any soldering. Might need to jiggle a little when you connect the monitor as it probably won’t be tight against the contacts. I had originally planned to go for a Transcend as that’s what most people seem to use but ended up going for an Integral one as it was much cheaper. Worked fine though. 4Gb will prob do too but 8 was as low as I could find. And no, you can’t replace the CPU in a non-pro unfortunately. You can in a Pro. Don’t know any other details. First remove all your drives and note the position they were in. This is especially important if you want to try to restore your RAID later without reformatting and starting from scratch. The N5200 is set up really nicely inside. It took me about 10 min to finish the hardware mods. Hopefully you’ll have some previous experience in taking apart and putting together things. There is a nice guide with pictures on this forum somewhere (here: thecususergroup.proboards.com/index.cgi?board=n5200modifications&action=display&thread=3855) which shows where the VGA header goes. Just open up your N5200 and stick the VGA header on the motherboard wher the holes are near the other ports. Plug in a USB keyboard and a VGA monitor and startup. Now turn off the system. Plug in the new RAM in place of the old, reboot and make sure the system identifies the new RAM correctly. The RAM is counted during the boot up process, very obvious on screen.